Strong protections against voter disenfranchisement are beneficial for all Americans, regardless of whether they belong to a class which has previously been targeted for disenfranchisement. If voter protections like the Voting Rights Act continue to be assailed, then every American runs the risk of one day being denied the right to vote if the party in power decides that their demographic is a threat. In recent years, right wing politicians have almost always been behind voter disenfranchisement measures—this is simply because right wing candidates are statistically unlikely to benefit from more people voting (higher voter turnout = electoral losses for right wing candidates), particularly when those voting are first time voters (first time voters tend to vote for Democrats). While right wing politicians may see the elimination of voter disenfranchisement protections to be in their short-term electoral interests, right wing voters need to realize that they would not similarly benefit. 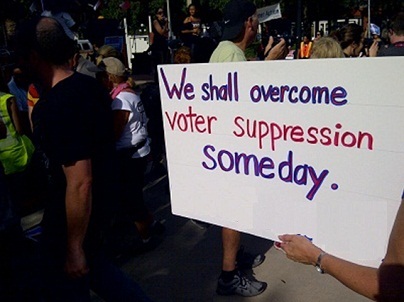 If voting rights protections continue to be eliminated and are not replaced, the right wing may run the risk of being the target of the very disenfranchisement that they once imposed on others. In contrast with the current left wing, the right wing coalition is fairly condensed in terms of demographic makeup: older, white, male, and rural voters tend to swing Republican. Because of their narrow demographic support base, the GOP would be particularly vulnerable to voter disenfranchisement if the Democrats ever decided to take a page out of the GOP playbook. A demographic shift away from a majority-white America and the natural attrition of the elderly population (older people dying off) promises a “demographic death-spiral” (in the words of Republican politician Lindsey Graham) for the GOP in the near future. 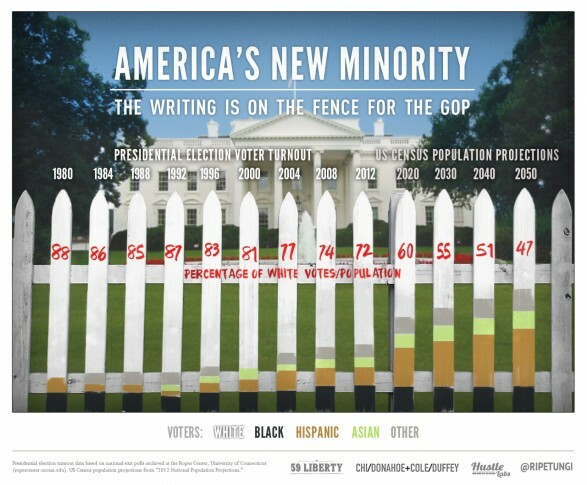 Two of the key Republican demographics are shrinking while key Democratic demographics (younger, non-white, urban voters) are ascendant—this suggests a future where the GOP demographics are in the minority and at risk for disenfranchisement in the way that black voters were in the past. If an immoral left-wing politician were to decide to enact voter disenfranchisement measures against the GOP, they could cripple the GOP by making it more difficult for rural, older and white voters to access the polls. By concentrating the polling places and resources in urban and majority non-white areas, it would make it more difficult for rural and white voters to access the polls. If they were to isolate polling places in the enclaves of Democratic constituencies and neglect those in traditionally GOP areas, a Democratic politician could dramatically swing the vote in their party’s favor. In particular, this tactic would harm the rural voters who make up the most reliable GOP Demographic. If polling places were focused in urban areas, this would require many rural voters to travel significant distances, avoid getting lost, and secure scarce parking in order to vote—it is likely that many would simply not bother. To further complicate the voting process for these Americans, the amount of information available on voting locations could be limited and only locally distributed to urban areas (ex. using paper fliers in urban areas but few online resources to spread election information). I in no way support this type of disenfranchisement (it is an inversion of the right wing disenfranchisement tactic of understaffing polling places in majority-minority areas), but the fact remains that it would be open to a less democratically-minded left winger. The moral of this story is that EVERYBODY has an interest in preserving the democratic process, even if they believe that they are not currently at risk of losing their rights—after all, the majority today may one day be the minority (particularly in politics). Any attempts to disenfranchise Americans, even if they tend to vote for a party that you don’t support, need to be stopped and those who promote them punished. Every American must stand up for the integrity of our democracy and demand that the right to vote be protected aggressively. A good start to this stand would be the immediate re-authorization of the Voting Rights Act with Section 4 (the section invalidated by the Supreme Court) expanded to include every voting district. 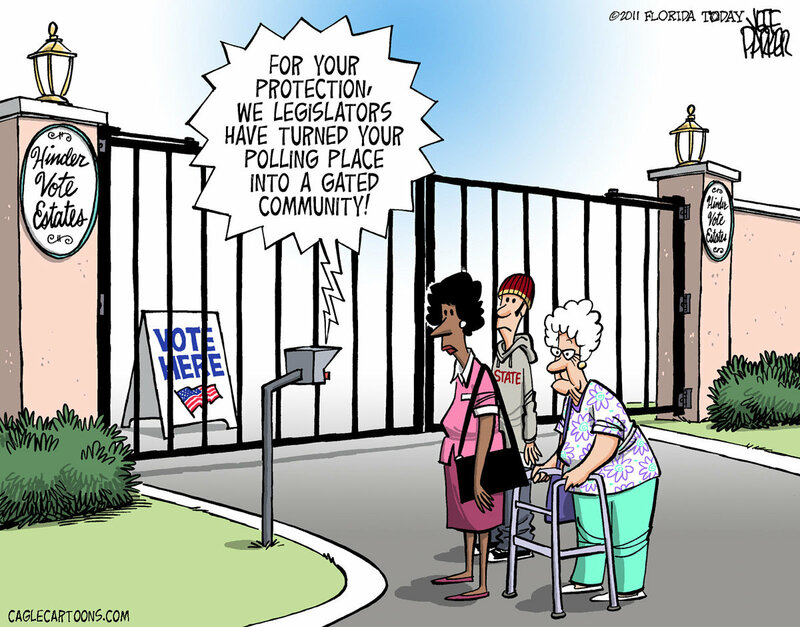 Put simply, if the right wing base fails to act now and continues to allow their officials to disenfranchise voters who are currently in the minority, nobody will listen to them complain if they are targeted in the future—a bad precedent will have been set and they will risk facing the very tactics which they once enjoyed using (to great effect).